Since it's launch in 2006, Twitter has revolutionized the ways we establish and maintain relationships on and offline. These women make the Twitterverse brighter. They inspire laughter, dialogue and reflection. Women were included based on 1) the value they add to Twitter via knowledge, insight, and/or humor 2) their willingness to engage with followers. Please note: This is not ranking of power or influence. This list is unranked because this is not a competition. The list will be divided into three parts, so subscribe to our RSS feed to get the rest of the list delivered directly to your inbox. The fashion world is notoriously exclusive, @thefashionbomb carved out her very own place in the industry. If you think fashion is for the superficial and vapid check out this woman's timeline. She'll change your mind. Her pitch-perfect writing has made the 20-something Chicago-native one the Black blogosphere's rising stars. You can always count on @sistertoldja to give a completely candid take on every topic du jour from dating to police brutality and everything in between. A self-described "Scholar, Writer, Poet, Playwright, Performing Artist, Filmmaker, Creative Organizer, Activist," no one so effortlessly delivers twectures (twitter lectures) with similar brilliance or breadth of knowledge as @drgoddess. She provides for free what many of us spend thousands of dollars to get. You'd never know that the woman behind @afrobella is one of the web's biggest beauty bloggers. Her 4 year old blog of the same name is credited with creating the natural hair blogger movement, and despite her incredible success, @afrobella still remains remarkably humble. While there are a number of twactivists (twitter activists), @aisha1908 provides a shining example of a woman willing to walk the walk. A public defender, @Aisha1908 offers insights into her profession as well as the criminal justice system. There are heroes among us. This woman might be one of them. It won't take long for you to find that @jonubian is extraordinarily well-read. Her timeline features musings on Black womanhood that will make you think, and after a couple of minutes, you'll come away with a new reading suggestion. It's refreshing to encounter a woman who's dedication to good Hip-hop remains unhampered by the commercialism, homophobia, and misogyny which seems to have taken over the mainstream. @glennishamorgan shares her passion and expert knowledge of the music world and feminist activism. @raelt's timeline is a constant source of inspiration. The renowned AIDS activist tweets honestly and earnestly about her experience as a Black woman living with the disease. An incredibly successful author with a career that most authors could only dream of, Ms. McMillan gives the twitterverse a glimpse into her private thoughts. @Gabifresh is MTV's first ever Twitter jockey. She got her start as a fashion blogger who won over the blogosphere with her sweet-as-pie personality. She's living proof that loving yourself will get your further than you could ever dream. The woman knows her sports. As an ESPN correspondent, Jemele continually represents in a field dominated by men. Even when she's bombarded with the tweets of angry extremists, @Profblmkelly takes the time to calmly and elegantly provide historical perspective on contemporary debates. @ch3ryl lives the life of a social media pioneer. Innovation is inspirational. She's combined her technical knowledge with a passion for social justice to create new opportunities for organizing the grassroots. @Danamo aggregates compelling links from around the web and adds her a touch of her signature commentary. Her interests are endearingly eclectic, and for a woman who's done and seen it all, she's wonderfully gracious. She's a skillful satirist and web-developer. At any moment you're bound to find something that will have you rolling. And really what more could you want? 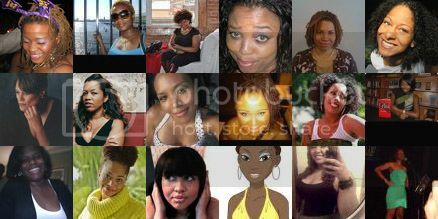 Take a look at Part 2 for even more inspiring sistas.